The Boy Scouts of America has always been a uniformed body, and one reason stands out above all the rest. We wear the uniform because it is a means of identifying ourselves openly with the principles to which we are committed: character development, citizenship training, and physical and mental fitness. The uniform is not intended to hide our individuality. It is a bond which ties millions of scouts throughout the United States. 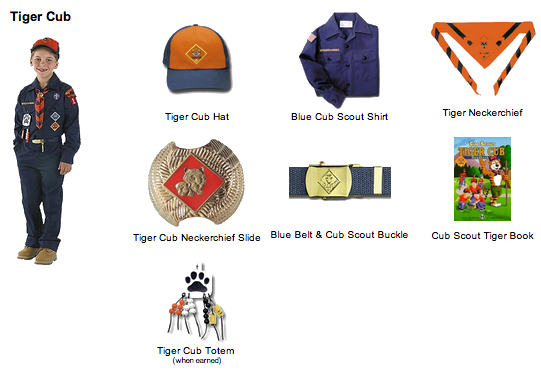 Pack 88 provides neckerchiefs, slides, badges, and awards. Those who are unable to afford the Basic Scouting Uniform may contact Pack Leadership for confidential assistance. To purchase your Scout supplies, visit the New England Southboro Scout Shop, located on Route 9 Westbound (just after the Sheraton) in Southborough. Basic Insignia is shown here followed by the Class A uniform based on Scouting Rank. For more details on insignia placement, see Page 3 of the BSA insignia guide.